You won't find this in art books! Copyright Alan Watson b.1957 St Andrews. All Rights Reserved. Private collection. Countless generations of my ancestors have been involved in the fishing industry of the East Neuk of Fife. This continuous tradition remained until the nineteen forties. After record catches in 1936 the winter herring went into rapid decline. As a result of this the post-war generation to which my parents belonged were discouraged from going to the fishing as their forefathers had done. By the mid nineteen sixties the big herring fleets operating out of East Neuk harbours had disappeared. It was at this time that my brothers, sister and I started to spend summer holidays with our grandparents. Although unaware of it at the time we were given a glimpse of a way of life which is now virtually obsolete. As anyone who heard them will testify, both my grandfathers were gifted storytellers. The majority of the stories they told concerned their early experiences aboard sailing bauldies in the years leading up to the First World War. 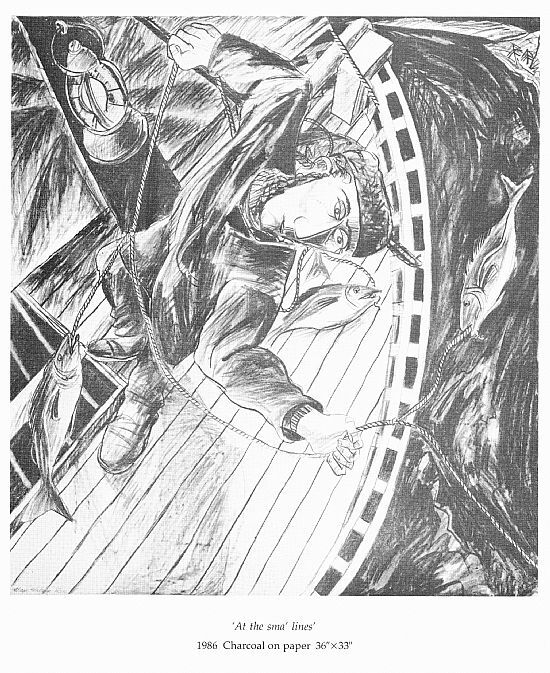 The longer tales ostensibly recalled the exploits of well known fishing characters. The narrative was a rich mix of local dialect and humour, counterbalanced with details explaining the fishing methods used by the East Neuk herring fleet at the time. These stories have now become the starting point for the series of paintings shown in this exhibition. With hindsight what is so striking to me about these stories is that they represent the last link in a long oral tradition. This enabled fishing methods to be handed down from father to son and adapted over the centuries. The successful fisherman relied upon all his senses to enable him to identify shoals of fish. The whereabouts of fish could be recognised through the behaviour of sea birds or the state and colour of the sea. Each skipper had a favourite spot in the Firth where fishing was consistently good for him. In order to reach that spot he would line up his boat with two prominent landmarks, for example, a church spire and a hill. These bearings were known as 'meids'. A more accurate or 'sharp meid' could be achieved by lining up with two sets of landmarks. The fisherman's ability to identify areas of sea, as we identify our position on land, extended to a topographical knowledge of the seabed. Whether fogbound or in poor visibility a greased weight was attached to a line and dropped to the seabed. When retrieved an approximate position could be ascertained by identifying the type of sand, shale or seaweed which had clung to the grease. One wonders if the comparatively recent introduction of electronic aids has robbed present day fishermen of the sense of intimacy and well-being with the environment which was enjoyed by their forefathers. Peter Smith, 'The Lammas Drave and the Winter Herrin', Edinburgh, 1985. ISBN-10: 0859761258; ISBN-13: 978-0859761253. Mary Murray, 'ln My Ain Words', 1982. Peter Anson, 'Fishing Boats and Fisher Folk on the East Coast of Scotland', London, 1930. Angus Martin, 'The Ring Net Fishermen', Edinburgh, 1984. George Gourlay, 'Fisher Life or the Memorials of Cellardyke and the Fife Coast', 1879. 369 Gallery, Edinburgh, and touring all over Scotland.